This bleeder valve, which is attached directly to the common rail, can be used to vent it after installing a new fuel filter unit. The opening is protected from dust and dirt using the end protection cap attached to the valve. Based on the 9-point testing plan used for this product, the valve is evaluated for flawless function, correct dimensions and further optical characteristics to ensure trouble-free operation. To prevent faults and leaks of the valve, the correct seal must be used during assembly. It must be tightened to the torque specified by the manufacturer. 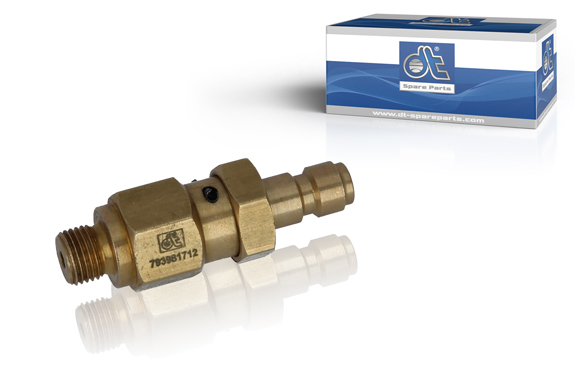 To bleed the article, the appropriate adapter must be pushed onto the bleeder valve and the fluid collected in a catchment tank via an approved hose, at best transparent. This prevents the fuel getting into neighbouring components and the environment. The hose also allows air particles in the system to be detected. It must also be ensured that the air was fully pumped out of the system to ensure flawless function. Rinsing based on the manufacturer’s requirements is required if there are contaminants in the fuel system.